Fumes from chemical containers often result to the storage cabinet’s corrosion and contaminated air in the laboratory. Ascent™ storage cabinet is ideal in providing a safe and convenient storage solution. 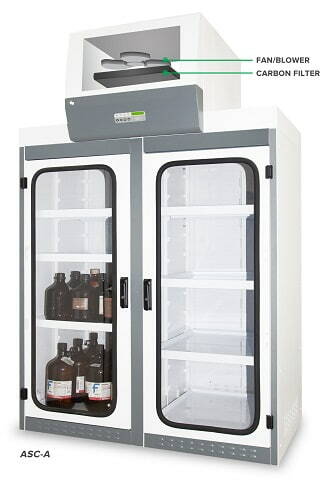 This cabinet is equipped with Nanocarb™ filters that effectively adsorb chemical fumes to provide operator and environment protection. ASC-A is equipped with a main carbon filter. Nanocarb™ filters are available in 8 types to suit your chemical list. Industrial grade main body constructed from E.G. Steel with Isocide™ powder coating.